Tara Bradford had everything going for her business, and the majority of her clients came directly from the video marketing she had been doing for a year. Suddenly, she decided to stop doing the videos. She was bored. And instead of finding ways to change her videos, and exploring other options in addition to the successful video activity, she. Just. Stopped. This is just one example we spoke about in terms of the choices we’ve made out of boredom and being too comfortable, that ended up taking us in completely different directions - and not always in a good way. Some of us just don’t recognize when we’re bored early enough to change direction with intention, rather than as impulse. Eventually, though, with enough self-reflection, we can start to see the symptoms before they become overwhelming. That’s the first step. The next step must be to consider our own roles in the scenario. And then? We must make the decision to take small steps toward digging us out of the situation, rather than rushing off into something we’re not really sure will take us where we want to go. 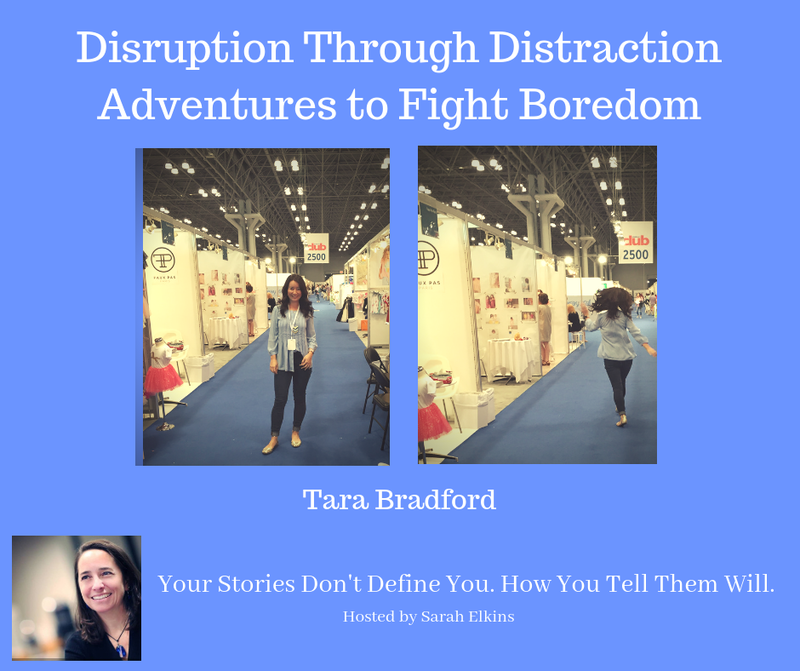 Tara’s brilliant strategy was to put herself into situations that a) made her uncomfortable, and b) had her interacting with people and industries she would never have otherwise experienced. How many times have you made a rash decision because you were dissatisfied, bored, or simply in maintenance mode in your life and/or business? What lessons did you learn from those experiences, and how do you choose to tell the stories so you’re learning from them, rather than being a victim of circumstances? Tara Bradford helps individuals gain clarity on their goals and objectives, communicate confidently about themselves and their businesses, feel more understood in their professional relationships, and reach a global audience with their message so they can become Best Selling Authors, TEDx Speakers and, if we dream even bigger, Nobel Peace Price recipients. Visit her website to learn more about what she can do to help you move forward - without those lateral distractions! And connect with her on LinkedIn to keep up with her extraordinary contributions to our global community. As often happens in these conversations, we took some twists and turns from topic to topic, and somehow found our way back to the original theme of the podcast: Our family history shapes us, and if we don't share those stories, we not only leave gaping holes in our understanding of ourselves, we lose our connection to other humans. February was a big month for self-discovery. Through coaching sessions and discussions with friends, I've been digging into some of my own motivations and weaknesses. One in particular has been a deep and recurring obstacle: Contentment and satisfaction without the need for external validation.